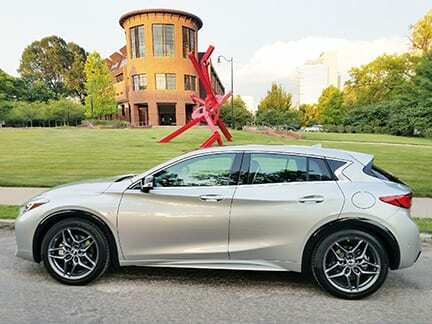 The open road awaits the driver with the roomy design that includes 34 cubic feet of cargo space in the new Infiniti QX 30 2.0T. The legendary INFINITI signature is evident in every curve and line of this elegant cross-over vehicle. It’s in the signature double-arch grille and the eye-inspired LED headlight. It is seen in the crescent-shaped C-Pillar and the dramatic shoulder line that is so deep and sharp that engineers developed a new 3D manufacturing process to get it just right. This is a vehicle that will redefine the mid-sized SUV. Not only does this Infiniti look sporty, it also feels sporty too. And here’s why. Contributing to an overall sporty feel, the speed-sensitive system requires less effort in low-speed situations yet it’s more firm at higher speeds. The handling is sharpened and the look is more aggressive, thanks to a lower and firmer suspension. It is paired with front cross-drilled brake rotors that help with air ventilation for impressive stopping performance. And when it’s time for “your turn,” as in actual making turns in the vehicle, that’s when the high-tech shocks take over. Drivers can feel the attention paid to tuning the shocks. They hold the vehicle tighter as you take turns while also softening the feel of rough pavement and bumpy roads, delivering a rare balance of responsive handling and a smooth ride. Engineers even reduced suspension noise to keep the ride comfortably quiet. The high-tech activities continue throughout the interior, exterior and underneath the hood. When it’s time to put the car in park position, it really is only a push button away, by simply pressing a button marked “P” — for parking of course!